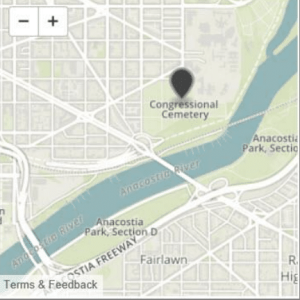 The cemetery’s now-pastoral grounds were filled with trash and spent syringes in the late-20th century. In the 1990s, a band of dog walkers raised money to begin a needed cleanup. 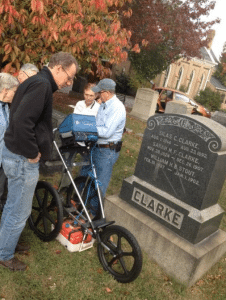 They envisioned a place open to the public, recalling the Victorian tradition of garden cemeteries, which were often the only open green spaces available to city dwellers. Not everyone embraced the idea of a graveyard full of puppies and joggers, but the group became responsible co-stewards of the site. Perry starts every job the same way. He finds a group of graves that have a well-documented provenance. Then he rolls his radar over the plots, slowly, step by step, back and forth. 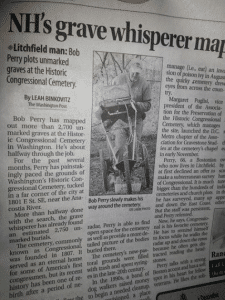 A screen between the cart’s handlebars provides a picture of gray squiggles that indicate any sort of Bob Perry has mapped out more than 2,700 unmarked graves at the Historic Congressional Cemetery Washington. He’s about halfway through the job. (Leah Binkovitz/The Washington Post anomaly in the ground. Most burials appear as little arches, but other items can show up, too; buried pipes, tree roots and the like.